A treasure trove of knowledge and experience to help you dodge the slings and arrows of costly business challenges we all face. 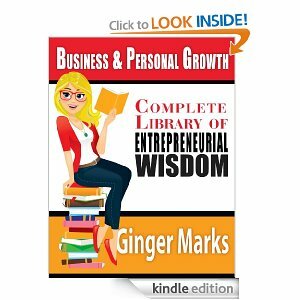 With over 30 years experience in multiple fields of expertise and businesses Ginger Marks shares with you what has helped her survive and flourish in all the ups and downs the business community and economy have endured. Inside the covers of this important collection of articles you will find a plethora of entrepreneurial wisdom spanning topics pertinent to the novice and experienced business owner alike. 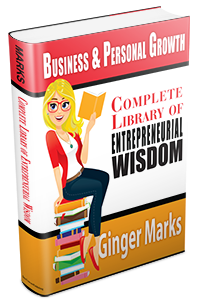 To make it easy for you to find the information you need at any particular time in your entrepreneurial walk Ginger has included topical sections and in the PDF version you’ll find a Topical Index. Here’s a quick peak some at the sage advice you’ll find within. In today’s online environment we all have our share of marketing nightmares we could relate. One that immediately pops into my mind is the store that uses pushy sales tactics. I don’t know about you but for me these stores tend to push me right out their door. I cannot think of a better example than this to teach us how to avoid losing potential customers. Let’s compare this live shopping experience with our online counterpart to gain some valuable insight. The basic thing they do is attack you the minute you walk in the door. So how do you avoid making your customer feel ‘pounced on’? At your first contact do you enter the chat room or offer your first message in the “it’s all about me” frame of mind? Do you tend to share about what your do before you have barely even introduced yourself? Stop for a moment and consider how this could be perceived? How would you react if you were on the receiving end? How can you turn this around? How do you tell your shopper what you have to offer without causing them to want to turn and run? The first thing you should do is kick that old “me” out of the door. Keep pushing; sometimes “me” wants to hold onto the doorposts. If you listen to what you are saying and concentrate on correcting this attitude you will succeed. Hang in there. You can and must do it for the sake of your business success. Now that you have kicked “it’s all about me” to the curb, welcome in “it’s all about THEM!” This one simple change can have a tremendous impact on your marketing efforts both on and off line. To effect this change take the time to figure out what you have and how it will make your shopper’s life easier or better. Start off by evaluating your product or service. Make a list of features and then try to figure out what benefit can be provided by the use of this feature. This is a mere sample of the content you will find and the knowledge you will gain. Download your copy today and begin saving yourself the time and frustration of learning the hard way how to and how NOT to run your business! Can’t wait? Click the images below to get your digital copy now!